It is likely that I’ve read The Eye of the World more often than any other book. But not in the last eight years or so, I guess? Hence this review, which is kind of difficult to put together. What can I say that hasn’t already been said extensively? In any event, the book is over twenty years old, so expect spoilers from here forward, and I can’t promise there won’t be spoilers of future books. But certainly not of the last several. As usual, the biggest tragedy of the book is Rand’s innocence, so soon to be shattered. I also notice that Perrin’s broodiness here matches his future multi-volume obsession with being the guy from Taken, and that Nynaeve is by far the best female character in the series (except maybe Moiraine, but it’s not really fair to count her, because she spends so much of her time as a cipher, mostly to be observed with only the barest of glimpses into her head). There is little that has made me so happy of late as her current position on the board. Otherwise, I only have two things to add about the kindle version and my current re-read. One is that through some quirk of odd fate, every instance of the word ‘whatever’ was capitalized. I really wonder whose search and replace thought that was a good idea? The other is a thing that I need to compare against a physical copy, so just a moment while I do that. (You can pretend while reading this sentence that the sentence isn’t here, and there was a pause while I hopped into the other room to dig through my bookshelf and make sure whether the copies are identical or not. This pause is also a good time to stop if you are worried about future spoilers somehow, because I take a lot of knowledge as self-evident in the rest of this paragraph.) And what hey, they match! So, here’s the thing: The grave is no bar to my call, right? The Horn of Valere? Here’s what is actually written on the Horn, though: Tia mi aven Moridin isainde vadin. Based on the rest of what I’ve seen of the Old Tongue, which tends to be pretty consistent, the literal translation is ‘To my call, Death is not a bar’. Unless, of course, one were to notice that a newish character has taken the name Moridin, and then one were to wonder why bother to capitalize that one word there, and then one were to notice that the Horn of Valere has been absent for pretty much the entire series, and having it just being Heroes of the Horn out again after all this time would feel kind of anti-climactic, and anyway, here’s my newest loony theory: the Horn is going to somehow affect Ishamael reborn, directly, as has been prophesied for the duration of said Horn’s existence. And if the Horn is older than the Age of Legends (I wonder if we know that either way? ), it is also an indication that this is the actual Last Battle after all, not just one such along the turning of the Wheel. Because that would be a spoiler for recent books. not obviously addressed in the current version of the FAQ, though my searching was not exhaustive by any means, and of course if someone has said it on rasfwrj in the past 8 or 10 years, I wouldn’t be in a position to know that. This entry was posted in Words and tagged epic fantasy, Kindle, The Wheel of Time on July 22, 2012 by Chris. 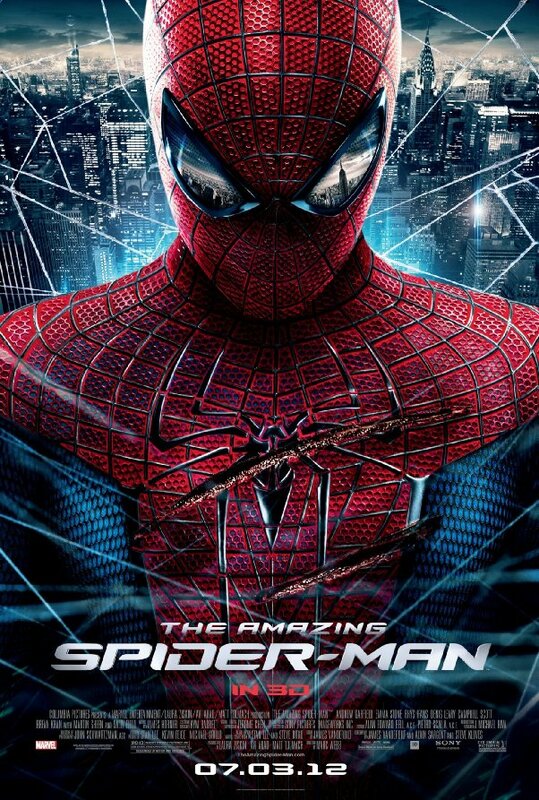 I’ve been putting off my review of The Amazing Spider-Man, mostly because I wanted to watch it again before settling on an opinion. But I’m about to finish a book, and what if I see the Batman movie soon (or something else could happen, I reckon), so yeah, it has become time. Anyway, it’s not like I missed anything or was confused, I think maybe the problem I had was concern that I’m going to be too effusive, and I wanted to look for flaws that revealed themselves on a subsequent viewing. It’s not that it was an amazing movie (despite the pun potential; it was certainly good), nor that the acting was incredible (though, y’know, it was good too) or that the plot was intricately mind-blowing. In fact, that right there is where I got all my happiness from. Because do you know what the plot was? A multi-issue comic book arc put to film. Not quite the density of a ’60s arc, modern sensibilities rule such things now, but it had all the aspects of those old books except foe-density. Solid measures of Peter’s personal life (after the origin had been settled) interspersed with web-slinging and Lizard-punching, plus occasional glimpses at the forthcoming story arc, a panel here, another one there, just enough to make it clear this is an evolving world with a past and a future, whether we get to see them or not. I don’t think anyone else has made that movie. I mean, yes, the Avengers cycle hints at what happens next, but always as an after the credits teaser, not just matter-of-factly built into the script. So that’s what made me like it so much. It wasn’t a perfect movie, but it may have been the most perfect translation of a superhero comic into a movie. 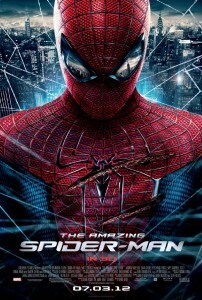 This entry was posted in Film and tagged 3D, action, Marvel, superheroes on July 21, 2012 by Chris. So, this is cool. 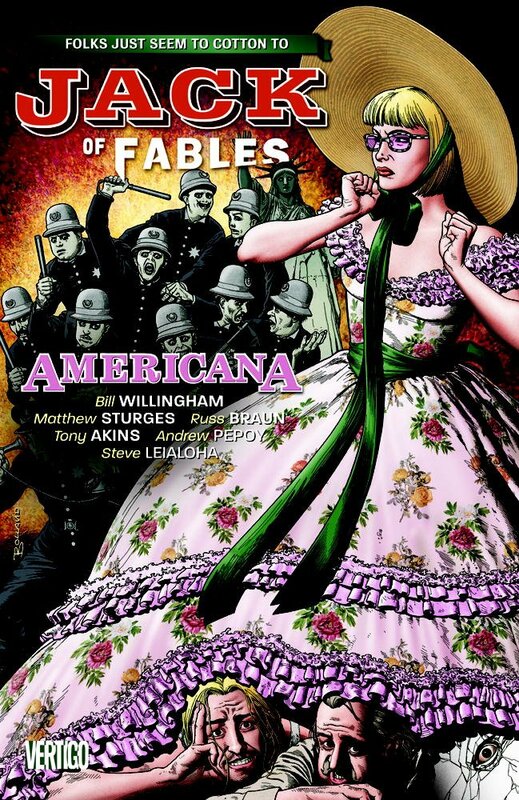 I’ve figured out what’s actually going on in Jack of Fables, way after the fact. (Probably way after anyone else who has read these books, for that matter.) Remember when he got captured by a bad guy named Revise who has been gathering up Fables and keeping them in a camp while making people forget that they ever had any stories, in the hopes of turning the whole world Mundane? Anyway, though, Americana: besides the other things that are obviously happening along the way as per above, Jack is now looking for a way into the American Fable country where he can find Cibola, the lost city of gold, and get, you know, rich. I’m glad that Revise’s three hot librarians keep managing to keep tabs on Jack, though, because they are stuffy and hilarious, and I think he would be insufferable if left to his own devices. No, seriously. It’s not just comic art rendering everyone hot. There’s a t-shirt and everything! Also, in case you care, the three hot librarians are sisters. Okay, I admit that knowledge to be gratuitous. 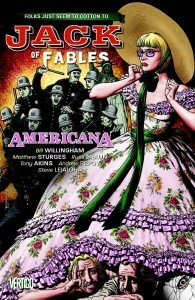 This entry was posted in Words and tagged fantasy, graphic novel on July 3, 2012 by Chris. I hate finishing the Miles Morales Spider-Man books, because I’m stuck the same place I’ve been for more than a year now, resenting the lack of Peter Parker. Why couldn’t he just have been a new character? And I want to say that the right answer is to just acknowledge it once and for all, take it as something that’s going to color all of my reviews, and consider the matter closed until and unless I change my mood on the topic. But then they write a scene where Aunt May and Gwen Stacy are trying to get on with their lives in Paris and see a newspaper announcing that there’s a new Spider-Man, and how am I supposed to ignore my plausibly unfair reactions when the writer of the story is right there telling me I’m not the only one? All the same, it is getting old at this point, so I suppose I’ll follow my own initial advice and disclaim right here: I resent these books, so far, for not having Peter Parker in them. I also resent the comics industry in general for training me to believe that this is only a temporary situation, even though the Ultimate Comics line has been, if not perfect, at least very good about leaving dead characters dead. So I keep thinking, “sure, but this time is different”, and that thread of hope also makes it hard for me to commit fully to the stories about Miles the way that I should. The upshot of all this is that it’s an ongoing issue, and I know about it, and I’ll try not to mention it anymore. Just so long as you try to be sure you stay aware of it, because otherwise my potential future hemming and hawing may seem odd. So, the kid Miles Morales who’s the new Spider-Man? He actually does have a pretty interesting life of his own, what with a criminal uncle who wants to exploit him, and his parents who have mixed feelings on the mutant-in-general and Spider-Man-in-specific phenomena, and his having been provisionally accepted by the official super-hero community, and especially by his being thirteen, which is just ridiculously young to be involved with all of these adults criminals and adult problems. Of course, the aspect I am the most intrigued by is the mirroring effect, where Miles’ uncle is not only not the driving agent of positivity in his life, but may well turn out to be the agent of destruction instead. Which of course makes me pretty excited for the next book in the series, where that question is likely to come to a head. This entry was posted in Words and tagged graphic novel, Marvel, superheroes, Ultimate Series on July 2, 2012 by Chris.